A friend recently confessed that after having a baby she ordered clothes from Top Shop’s website *every single day* just so as to have something to look forward to. She only stopped when she realised how much money she was spending on envelopes to send them all back in. That same friend would never dream of ordering wine online. Why not? In the Daily Telegraph tomorrow (or online – here – today) I’ve written about some of the whats and the whys of buying wine over the internet. What does this mean? Taken literally, almost nothing, it’s just a re-statement of the fact that those who don’t buy wine online don’t because they don’t want to. But the phrasing suggests that there is more to it – that buying wine in person might be, well, more personal. What rubbish. Yes, if you go into an independent wine merchant of course it is, but most pick it up from the supermarket shelf – about the least personal experience possible. Contrast that with the far more engaging experience of connecting with smaller importers or hearing directly from the producer whose wines you are buying – online trends that may still be small but are gathering momentum. 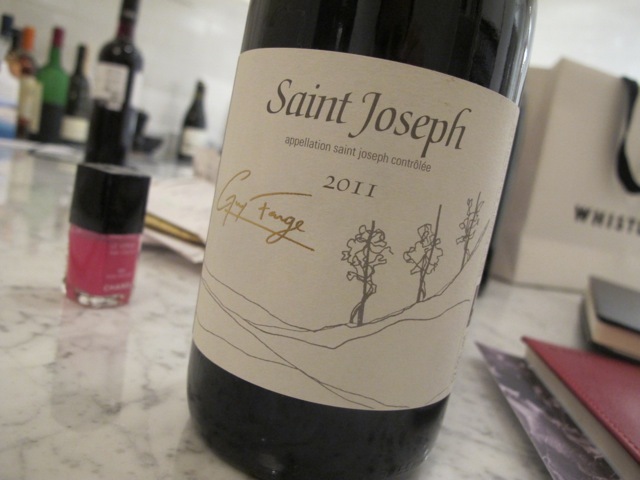 One of the wines I recommend in The Telegraph is a Rhone syrah, the completely gorgeous Guy Farge Terre de Granit St Joseph 2011 (Swig.co.uk). I was so taken with it on tasting (OK, drinking) it at home that I mentioned it on twitter, then got a late night email from lovely Robin at Swig to say he’d been looking for some music online, noticed a mini-surge of orders and was so pleased about it that he wanted to know if I’d like to offer it at the special price of £17.50 (down from £19.50) for one week for Telegraph readers. Of course I said yes. Don’t give me not personal…. * Sunday 24th Nov footnote – Wow, Telegraph and Planet Victoria readers bought all the St Joseph. Swig have some more on the way over from France. It will arrive in time for Christmas and anyone wanting to buy the wine at the lower price can still do so if the order is placed by Friday.